Are guaranteed the Day and Time for each appointment that’s best for your busy schedule. 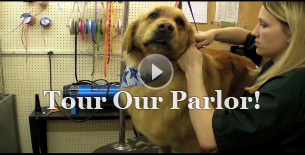 Provide your Pet a continuous grooming program that fits its needs. Just provide our receptionist your preferred day/time of week and number of weeks between appointments and they will be happy to book your pre-book schedule. For your convenience, Peaches’ Parlor will provide you a magnetized schedule confirming the dates and times for all your grooming appointments.